Bask in the Caribbean sunshine as the sparkling blue water gently laps at the side of your private catamaran, while you enjoy the serenity of sailing on your way to Isla Mujeres, the Island of Women. You'll experience the wonder of snorkeling on the area's famous coral reefs, and listen to the rhythms of Caribbean music. Sound good? It's perfect for your group of up to 60 people. Wedding parties, family reunions, and company retreats are all welcome for these luxurious snorkeling trips, or if you prefer you can do a romantic sunset cruise, it's up to you! For guests staying in the Riviera Maya, we can arrange transportation to Cancun so you don't have to miss out on the fun! Boat: 58' Sailing Catamaran for up to 60 people. We also have larger and smaller catamarans for bigger or smaller groups! See More Private Catamarans. Tour Schedule: Daily on your schedule. 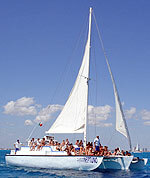 Daytime snorkeling trips, Isla Mujeres sailing tours, or fun Sunset Cruises available. Duration: Half-day Charters are 4 hours. Full-day Charters are 7 hours. We can add extra hours for $465.00 per hour upon request. * Add-On Price is $245.00 total cost for up to 50 people, plus $70 per person for additional people beyond 50. For shorter trips, you can add a buffet lunch for $18.00 per person. To go snorkeling and to go to the beach club for lunch would require at least a 5 hour trip. For 4 hour trips, you can have lunch at the beach club if you don't snorkel, or you can have lunch on the boat. Optional transportation fee, paid directly to your driver in cash on the day of the trip. If you will meet at the marina, you don't have to pay this fee, only if you're using the optional transportation service. Extra Cash for Marine Park and Dock Fees, Transportation or other Optional items.